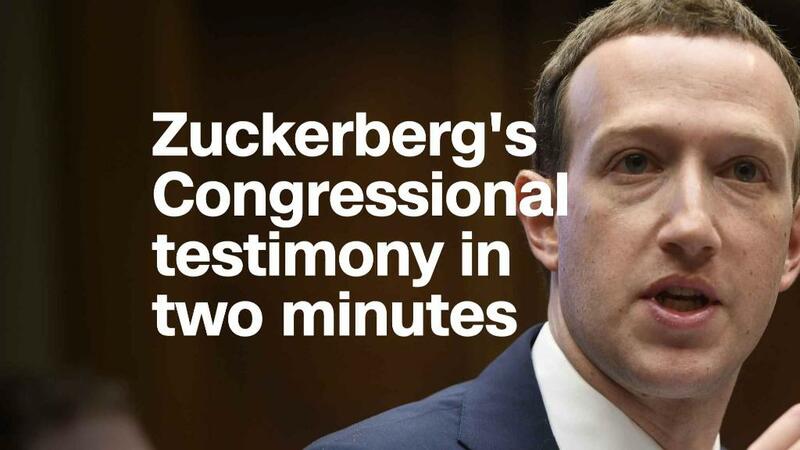 Mark Zuckerberg is set to testify before the European Parliament on Tuesday, and the Facebook CEO is likely to face tough questioning. It might prove more challenging than his hearing in the Congress last month. Data privacy is a much bigger priority in Europe, especially this week. And Facebook has been in Europe's crosshair for a while. Privacy is a big issue for Europeans. The EU has been fighting with big US tech companies over data privacy for years. It even went into open conflict with the US government in 2015, when it withdrew a data sharing agreement because of "mass indiscriminate surveillance and interception" of personal data by the US authorities. "The European tradition on privacy is stronger than that in the US, particularly in relation to corporate invasions of privacy, which from a European perspective the US seems to have been notably soft over in the last few decades," said Paul Bernal, senior lecturer in IT and media law at the University of East Anglia. "Some members of the European Parliament are far more expert in the field than those in Washington," he added. The General Data Protection Regulation (GDPR) goes into effect across the European Union on Friday, introducing much tougher rules on data privacy. Facebook (FB) has already changed its policy to comply with the regulation, but the lawmakers are likely to press Zuckerberg on the issue. "The parliament was an important driver behind the new GDPR legislation...particularly the liberal and green party politicians who try to make themselves [known] as privacy advocates already signaled that they are going to be tough on Mr Zuckerberg," said Marc-Al Hames, managing director of Cliqz, a German data protection technologies start up. Facebook's whole business model lies on its ability to sell targeted advertising, something GDPR will make a lot more complicated. And while Facebook is an American company, European regulators feel strongly about its powers over Europeans. Vera Jourova, Europe's top justice official, said the Zuckerberg meeting is in the interest of Europeans, because more people on the continent use Facebook than in the US. Official disclosures show the company has spent millions lobbying in Brussels, with data protection and privacy high on the agenda. "GDPR was designed pretty directly to be able to have an impact on Facebook ... as a result, has some real teeth. So Zuckerberg knows that if he gets it wrong, Facebook could be in trouble," Bernal said. Zuckerberg will meet the members of the European Parliament that lead its political groups, as well as with lawmakers from its justice committee. Guy Verhofstadt, the leader of ALDE, the Alliance of Liberals and Democrats for Europe, will be attending the meeting. He said EU citizens have been affected by Facebook's recent data scandal, and "deserve to hear the truth." He has also taken to Twitter to suggest questions he should ask Zuckerberg. Claude Moraes, the chair of the European Parliament civil liberties, justice and home affairs committee, said Facebook's general statements on "taking privacy very seriously" are "not sufficient." "Mr Zuckerberg and Facebook will have to make serious efforts ... to convince individuals that Facebook fully complies with European data protection law," he said in a statement. The European parliament is usually not the center of the political attention in Brussels and Tuesday's meeting will give it a rare opportunity to take the spotlight. The European Union has a proven track record of taking a tough stance against big US tech companies. European regulators slapped a €2.4 billion ($2.7 billion) antitrust fine on Google last June -- the latest broadside fired at big American tech companies doing business in the region. Facebook has been fined €110 million ($122 million) for misleading European officials about its takeover of WhatsApp. Apple (AAPL) is still fighting a demand by the European Commission that it repay €13 billion ($14.7 billion) in back taxes to the Irish government. And Amazon has been ordered to repay €250 million ($293 million) in unpaid taxes to Luxembourg.